Solar Integrated Roofing Corporation (“SIRC”) is a Nevada Registered and a California-based solar power technology and system integration company founded in May of 2007. We are focused on developing our expertise and expanding our market share in the installation of residential and commercial solar power systems. The customers of SIRC range from small private residences to large apartment complex solar power users. SIRC is seeking to expand its market presence and share in greater San Diego California. 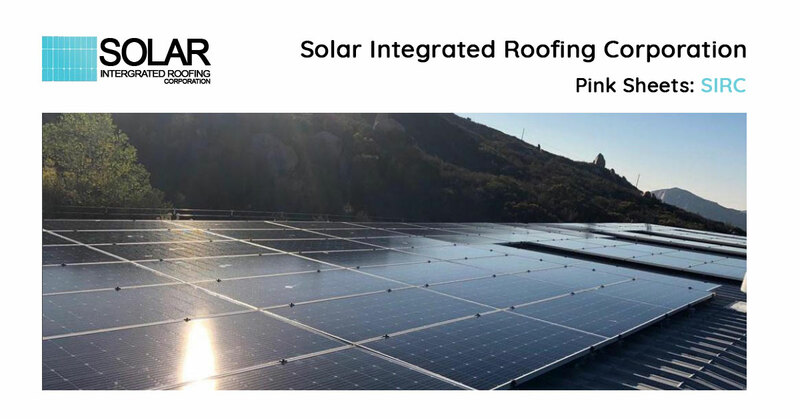 SIRC has an opportunity to acquire a highly profitable roofing contractor with more than 30,000 established customers who would benefit from solar energy. SIRC has an opportunity to acquire a highly profitable marketing company with thousands of customers that precisely our market for solar installs. SIRC has an experienced, technically sound management team that has demonstrated results and fiscally responsible governance. SIRC is one of the leading solar power technology, solar system integrator, and fullservice solar power solution companies in Southern California. Located 20 minutes east of San Diego, California, SIRC is committed to reducing the world’s carbon footprint and in becoming the nation’s mainstream source of power by transitioning from traditional energy sources to solar power. SIRC offers highly sophisticated and efficient system designs, tailored to each client’s specific needs. SIRC provides a "Production Guarantee" and a 25 yr no cost warranty on all of their solar projects. Acquire a roofing installation firm in Southern California wich provides the opportunity to access over 30,000 existing customers for solar Installation. Secondly acquire a marketing firm in Southern California to market solar and roofing products and services.